This weekend Richard Wershe, Jr. observed another birthday in prison as part of a life sentence for non-violent drug dealing. One reason he may remain behind bars is his outsized reputation as a dope dealer, aided in no small part by his nickname White Boy Rick. This is the story of that nickname. Rick Wershe turned 46 yesterday. He spent his birthday as he has every birthday since 1988—behind bars, serving a life sentence the politicians and judges are reluctant to reduce. After all this is White Boy Rick. With a street hood nickname like that he must have done something bad. Well, yes and no. Yes, he tried—but failed—to become a big-time dope dealer. But he was never involved in the deadly violence we associate with cocaine trafficking. What he did was help the FBI and Detroit Police, beginning at age 14, bring down a major drug gang, and later, he helped the FBI prosecute a dozen or so crooked cops. THAT is the likely reason he remains in prison long after the Michigan Supreme Court struck down the mandatory-life drug law he was convicted under as unconstitutional. He informed on dirty cops with political connections. But! But! He was WHITE BOY RICK! How did he get that nickname that the Detroit media loved to use over and over when he was arrested and prosecuted? Isn’t that what he was called by the drug dealers he consorted with and informed on? Doesn't that prove he was a major badass? No. As reported earlier by Informant America he was known among the Curry Brothers and their co-conspirators simply as Ricky. Ricky from the ‘hood. There has been a lot of speculation about the White Boy Rick nickname and where it came from, most of it wrong. This post is about how Richard J. Wershe, Jr. came to be known as White Boy Rick. A now-deceased major dope dealer named Arthur Dale “Art” Derrick claimed under oath in 2003 that he and his business partner came up with the name White Boy Rick for Richard Wershe, Jr. for a very pragmatic reason, which we will get to in a moment. First, here’s some background about this guy. In the mid to late 80s, Art Derrick was one of the biggest Detroit dope dealers you never heard of. Derrick was white. He lived in luxury in a walled residential compound in what he described as the most expensive home in Harper Woods, one of Detroit’s northern suburbs. By his own admission Derrick had lots of the “toys” typically associated with big-time drug dealers. He had a fleet of Corvettes. He had four airplanes including a four-engine private jet. Art Derrick was a high level cocaine wholesaler but he was never in the headlines. He was a key source of supply for Detroit’s big-time cocaine dealers.Derrick had connections in Miami and he could fly loads of dope to Detroit on his private aircraft. He once filed a lawsuit against the City of Detroit because police narcs had seized $181,310.94 in cash from him. Derrick argued unsuccessfully that Michigan’s drug forfeiture statue didn’t allow such a seizure. Derrick says at the time he was arrested by DEA agents his net worth was about four million dollars. When Rick Wershe set out on his ill-fated quest to become a big dope dealer, one of his mentors, according to Art Derrick, was himself. He claims he helped Rick Wershe get started. Rick agrees he did some dope business early-on with Derrick but he disputes how instrumental Art was in helping him, particularly with major connections in Miami. Regardless, the young white kid’s name—Rick—was a problem for Derrick and his partner because they had another “Rick” as a major customer; Rick Carter, who was black. They found it confusing to talk about dope deals with “Rick.” Which Rick? Maserati Rick became the major drug dealer that White Boy Rick hoped to be but never was. Rick Carter met a violent end as so many inner city dope dealers do. But he went out in style. 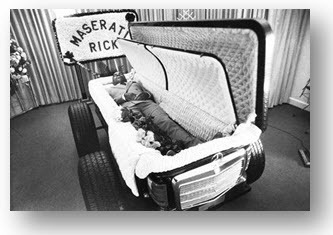 He was buried in a casket fashioned to look like a Mercedes Benz. Derrick believed the narcs picked up the White Boy Rick nickname from him when they heard him using it. The police love to call criminals by their street names. It adds some cred to their work as guardians of the street. Fawning Detroit reporters who depend on tips and leaks from the cops for their jobs were, in turn, only too happy to use the name.Their editors loved it, as well. It made for great headlines. But it conjured a persona that didn’t exist in reality. Today, most Detroiters couldn’t tell you who Richard Wershe, Jr. is. But many still remember the name White Boy Rick. So do judges, politicians and members of the Michigan Parole Board. The nickname has damaged Richard Wershe, Jr.'s reputation for years and it has helped keep him in prison. Art Derrick was indicted by a federal grand jury and convicted in 1989 for operating a Continuing Criminal Enterprise, the federal law known as the “kingpin” statute because it is used against top-tier drug traffickers. He was also charged with tax evasion. Rick Wershe, allegedly a "kingpin", was never charged under the kingpin statute. Derrick served six years of a 10-year federal sentence for being a major drug trafficker. Derrick was also convicted in a drug case in Macomb County. He was sentenced to five-to-20 years, to be served concurrently with the federal conviction. Art Derrick was far, far bigger in the Detroit dope scene than Rick Wershe ever was. He did six years while Rick Wershe has now been in prison 27 years. But then, Art Derrick never helped the FBI prosecute corrupt Detroit cops with political friends with the power to carry on an imprisonment vendetta. In last week’s blog post I mistakenly used pounds for kilos in describing the case against Rick Wershe. The post said his case involved 8 pounds. It was 8 kilos, which is 17.6 pounds. Also, a previous post said Rick Wershe acted for a time as a mule, a drug courier for the Curry Brothers drug organization while he was working undercover for the Detroit federal drug task force. Wershe says this is not true. He says he never transported drugs for the Curry Brothers.